"New Hampshire College" redirects here. For the former New Hampshire College of Agriculture and the Mechanic Arts, see University of New Hampshire. Southern New Hampshire University (SNHU) is a private university located between Manchester and Hooksett, New Hampshire. The university is accredited by the Commission on Institutions of Higher Education of the New England Association of Schools and Colleges, along with national accreditations for some hospitality, health, education and business degrees. With its online programs expanding, SNHU is one of the fastest-growing universities in the United States. SNHU uses an open enrollment policy that requires only a high school diploma or GED. The university was founded in 1932 by Harry A.B. Shapiro and his wife Gertrude Crockett Shapiro as a for-profit institution focused on teaching business. It was opened under the name the New Hampshire School of Accounting and Secretarial Science. In 1961, it was incorporated and renamed New Hampshire College of Accounting and Commerce. The state of New Hampshire granted the college its charter in 1963, which gave it degree-granting authority. The first associate degrees were awarded that year, and the first bachelor's degrees were conferred in 1966. The college became a nonprofit institution under a board of trustees in September 1968, and its name was shortened to New Hampshire College in 1969. The 1970s were a time of growth and change. The college moved from its downtown Manchester site to the now 300-acre (120 ha) campus along the Merrimack River at the northern border of Manchester with the town of Hooksett in 1971. Academic offerings expanded with the Master of Business Administration's introduction in 1974, as well the human services programs adopted from Franconia College, which closed in 1978. In 1981, New Hampshire College received authorization from the New Hampshire legislature to offer Master of Science degrees in business-related subjects, as well as Master of Human Services degrees (all human services programs would eventually be transferred to Springfield College in Massachusetts by the end of the decade). That same year, the college opened its North Campus on the site of the former Mount Saint Mary College, which had shut down three years earlier. The North Campus became the home of the culinary arts program, which was established in 1983. Ultimately, the North Campus was sold, and all its academic programs were reconsolidated onto the main campus. This spurred several major construction projects on the main campus in the mid-1990s: Washington Hall, a residence hall; Webster Hall, home to the School of Business; the Hospitality Center, home to the Quill (a student-run restaurant) and culinary arts programs; and Belknap Hall, now home to the Institute for Language Education, the School of Education, and several university offices. In 1995, New Hampshire College began offering distance learning programs through the Internet. In 1998, academic degrees were expanded to include the Ph.D. in community economic development and the Doctor of Business Administration. New Hampshire College became Southern New Hampshire University on July 1, 2001. A new residence hall, New Castle Hall, was completed in 2001, while a new academic facility, Robert Frost Hall, containing the McIninch Art Gallery, was completed in 2002. When nearby Notre Dame College closed, three of Notre Dame's graduate education programs and two undergraduate education programs transferred to SNHU. When president Paul LeBlanc took over in 2003, the early 2000s recession had affected the school with rising tuition and shrinking enrollment. LeBlanc addressed this in 2009 with an increased focus on the College of Online & Continuing Education. Rapid revenue growth from the division helped save the struggling main campus, where enrollment had slumped. The school focused on increasing graduation rates and adjusting the online college to meet the needs of the working adults that make up most of its student body. Student housing continued to grow with Conway and Lincoln Halls opening in 2004, and Hampton and Windsor Halls in 2006. SNHU became New Hampshire's first carbon-neutral university in 2007, when president LeBlanc signed the American College & University Presidents' Climate Commitment The Academic Center and the Dining Center were completed by 2009. A new 152-room residence hall, Tuckerman Hall, was opened in the fall of 2013. A 50,000-square-foot (4,600 m2) Learning Commons was opened in 2014, housing the library, the information technology help desk, a café, and media production services. The former Shapiro Library was reopened as the William S. and Joan Green Center for Student Success, a student center housing conference rooms and meeting space, along with student services for women, learning disabilities, veterans and other groups. The university purchased naming rights to the downtown Manchester Civic Arena in September 2016, naming it SNHU Arena for at least 10 years in a deal that included internships for students and use of the facility for graduation and athletic events. SNHU absorbed the faculty and staff at Daniel Webster College along with the engineering and aviation programs, operating the college's campus in Nashua for the rest of the 2016-17 academic year after its parent company, ITT Technical Institute, filed for bankruptcy. SNHU purchased the college's aviation facilities (including a flight center, tower building, and hangar) at Nashua Airport, for $410,000 and enrolled up to 30 students in their Aviation Operations and Management bachelor’s degree program. An undisclosed Chinese university, which plans to open a satellite campus, outbid SNHU for the former campus. To accommodate the new students, SNHU converted an unused warehouse on campus into space for classrooms, laboratories, and a machine shop. SNHU plans to construct an additional engineering building by 2019. Three major construction projects were completed in 2017: the Gustafson Center, a new welcome center named for the former university president Richard A. Gustafson; Penmen Stadium, a 1,500-seat outdoor stadium; and Monadnock Hall, an apartment-style residence hall. In November 2017, the university announced a $100 million project including a 1,700 space parking garage and an additional 500 jobs at its downtown Manchester offices supporting the online college. Another residence hall, Kingston Hall, opened in August 2018, replacing three of the campus's original dormitories (Chocorua, Kearsarge, and Winnisquam halls). In recent years, the school operates like many large for-profit schools with over 6,000 adjuncts supporting its services and a national advertising campaign that composes as much as 20% of its operating budget. It primarily targets nontraditional students, many of whom have jobs and families and cannot attend a residential campus. Robert Frost Hall is located on the main campus in Manchester, New Hampshire. SNHU's College of Online & Continuing Education offices, located in the Manchester Millyards near SNHU Arena. The three-year Honors Program is a custom-designed, integrated academic experience that is offered over the course of six semesters for business majors. As a result, students earn an undergraduate business degree in three years rather than four. It was started using a challenge grant from the U.S. Department of Education in 1995. SNHU offers similar accelerated programs to undergraduate students majoring in creative writing and justice studies as well. Southern New Hampshire University's COCE offers programs both online and at its three regional centers. The university's main campus serves as a regional center, in addition to satellite campuses in Salem, New Hampshire and Brunswick, Maine. After Trinity College in Vermont closed in 2001, SNHU established the Vermont Center in Colchester, which houses the field-based graduate program in education. Enrollment in the College of Online & Continuing Education (COCE), based in downtown Manchester, has increased rapidly: from 8,000 students in 2001 to 34,000 in 2014, to over 80,000 according to the school. As the online program has grown, the COCE has hired more full-time professors (as of 2014, most of the more than 2,700 faculty members were part-time instructors located throughout the United States and abroad). Alumni and educators outside of the school have criticized the university's aggressive recruiting techniques and nationwide advertising campaigns, comparing them to those used by for-profit institutions such as the University of Phoenix and the now defunct ITT Technical Institute. In response, president LeBlanc stated that SNHU has "borrowed the best of operational practices from the for-profits (customer service, data analytics, a sense of urgency and accountability) while eschewing the practices that cast them in such a poor light." SNHU's College for America (CfA) offers degrees that rely on competency-based learning rather than traditional credit hours, based in part on programs at Western Governors University. In 2013, the CfA became the first of its kind to gain federal approval from the U.S. Department of Education. In 2017, it formed a partnership with the U.S. Office of Personnel Management, making all federal employees eligible for CfA courses. Southern New Hampshire University is accredited by the New England Association of Schools and Colleges and is approved by the New Hampshire Department of Education Division of Higher Education—Higher Education Commission. The School of Business is accredited by the Accreditation Council for Business Schools and Programs. Some programs have specialized accreditation, such as the sport management programs, which are recognized by the North American Society for Sport Management, and the hospitality administration program, which is recognized by the Accreditation Commission for Programs in Hospitality Administration. Nationally, it is a member of the Association of American Colleges and Universities, the American Council on Education, and the National Association of Independent Colleges and Universities. At the state level, it is a member of the New Hampshire College & University Council (NHCUC), a consortium of higher learning institutions in New Hampshire. US News & World Report ranked Southern New Hampshire University at #112 in Regional Universities North, and #1 in Most Innovative Schools in the 2019 rankings. Fast Company has named SNHU the 12th most innovative organization in the world in its World’s 50 Most Innovative Companies edition. Additionally, the university has been repeatedly recognized by The Chronicle of Higher Education as one of the best colleges for which to work. The School of Business and the COCE have won multiple "Best of Business" Awards, for Best MBA Program and Best Online Degree Program, respectively. These awards are presented annually by the New Hampshire Business Review. The university's community economic development program received a 2007 New England Higher Education Excellence Award, the Robert J. McKenna award, named for the former Rhode Island state senator and New England Board of Higher Education chair. It is presented each year to an outstanding academic program. Southern New Hampshire University has many student organizations on campus, including Radio SNHU (the campus radio station) and The Penmen Press (the student newspaper). SNHU also publishes The Penmen Review, an online creative writing journal for students and alumni. Southern New Hampshire University participates in NCAA Division II athletics. The school is a member of the Eastern College Athletic Conference and the Northeast-10 Conference. The teams' nickname, the Penmen, is an homage to the university's history as an accounting school. The university's mascot is named "Petey Penmen". Lou D'Allesandro was appointed the first athletic director and head coach of the men's basketball team in 1963. Future NBA head coach P.J. Carlesimo coached the men's basketball team during the 1975–1976 season, compiling a 14–13 record and winning the Mayflower Conference championship. The Stan Spirou Field House is named after longtime men's basketball coach Stan Spirou, whose career spanned from 1985 to 2018. He is considered one of the most successful NCAA Division II basketball coaches, compiling a career winning percentage of .652 (522–279), four New England Collegiate Conference Coach of the Year awards (1993, 1994, 1995, 1999), and was named the National Coach of the Year in 1994 by Division II Bulletin. His teams have averaged 22 wins per season and also have 14 NCAA tournament appearances, four NCAA regional titles, and six NECC tournament championships. In 1989, when it was known as New Hampshire College, the Penmen won their first NCAA Men's Soccer Championship, against UNC Greensboro. In 2002, the men's soccer team returned to the NCAA Division II championship game, but lost to Sonoma State. On December 7, 2013, the Penmen won their second NCAA men's soccer national title, defeating Carson-Newman, 2-1. SNHU is a recipient of the NCAA Foundation Academic Achievement Award, which recognizes high graduation rates among student athletes. SNHU took home the award for the highest graduation rate among all Division II schools. SNHU also earned the Northeast-10 Conference Academic Achievement Award after the 2001–02 school year. P.J. Carlesimo was head coach of the men's basketball team throughout the 1975–76 season. ^ a b c d e f g "History". SNHU. Retrieved September 25, 2013. ^ "U.S. and Canadian Institutions Listed by Fiscal Year 2012 Endowment Market Value and Percentage Change* in Endowment Market Value from FY 2011 to FY 2012 (revised February 4, 2013)" (PDF). NACUBO.org. February 4, 2013. Archived from the original (PDF) on May 12, 2013. Retrieved June 13, 2014. ^ "Leadership". SNHU. Retrieved February 14, 2014. ^ a b c d e "Southern New Hampshire University". National Center for Education Statistics. Retrieved June 9, 2017. ^ "Southern New Hampshire University: Overview". U.S. News & World Report. Retrieved April 23, 2014. 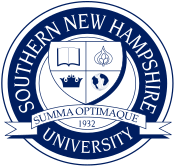 ^ The No-Sweat Guide to Branding: Southern New Hampshire University's branding standards. March 25, 2010. Retrieved November 13, 2017. ^ "Accreditations". SNHU. Retrieved 2018-02-10. ^ Biello, Peter. "SNHU President Details Major Manchester Expansion". Retrieved 2018-02-10. ^ a b Adams, Susan (2019-03-28). "Meet the English Professor Creating The Billion-Dollar College Of The Future". Forbes. Retrieved 2019-04-01. ^ a b Lessard, Ryan (February 23, 2017). "College satellite closes in Manchester". The Hippo. Retrieved September 26, 2017. ^ "Hooksett's Mount Saint Mary's to be Converted to Condos" (PDF). Brady Sullivan. Archived from the original (PDF) on August 4, 2016. Retrieved July 18, 2016. ^ "New Castle Hall". SNHU. Retrieved November 7, 2017. ^ "McIninch Art Gallery". SNHU. Retrieved November 16, 2017. ^ Forbes, Tina (September 14, 2016). "SNHU to continue academics, employment for Daniel Webster College students and staff". Nashua Telegraph. Retrieved July 27, 2017. ^ a b c Kahn, Gabriel (January 2, 2014). "The Amazon of Higher Education". Slate. ISSN 1091-2339. Retrieved February 9, 2018. ^ "Lincoln & Conway Apartments". SNHU. Retrieved November 17, 2017. ^ a b "New Hampshire Health & Education Facilities Authority" (PDF). Roosevelt & Cross, Inc. May 18, 2016. Archived from the original (PDF) on November 18, 2017. Retrieved November 17, 2017. ^ "Carbon Commitment Charter Signatories" (PDF). Second Nature. Retrieved July 10, 2017. ^ "Renewable energy hedge deal blazes carbon-neutral trail". New Hampshire Business Review. June 22, 2007. Retrieved July 10, 2017. ^ Lannan, Katie (July 10, 2012). "SNHU wants to build dorm for 300 students". New Hampshire Union Leader. Retrieved April 8, 2013. ^ "Tuckerman Hall". SNHU. Retrieved April 8, 2014. ^ "Shapiro Library". SNHU. Retrieved September 22, 2015. ^ "SNHU Celebrates Ribbon Cutting". High Profile. December 22, 2016. Retrieved November 15, 2017. ^ a b Solomon, Dave (February 2, 2016). "SNHU buys naming rights to Manchester arena". New Hampshire Union Leader. Retrieved February 10, 2018. ^ a b Houghton, Kimberly (September 19, 2016). "SNHU offers to buy Daniel Webster College campus". New Hampshire Union Leader. Retrieved September 19, 2016. ^ Houghton, Kimberly (December 25, 2017). "Partnership between Nashua flight school and SNHU brings aviation careers back to NH". New Hampshire Union Leader. Retrieved February 13, 2018. ^ Kennedy, Mike (October 24, 2017). "Former Daniel Webster College campus in Nashua, N.H., is sold". American School & University. Retrieved October 24, 2017. ^ Swanson, Cassidy (July 30, 2017). "SNHU will not buy former Daniel Webster College campus, university rep says". WMUR. Retrieved July 31, 2017. ^ "On-Campus STEM Programs". SNHU. Retrieved July 5, 2018. ^ a b Patterson, Kristin (July 21, 2016). "SNHU College of Online and Continuing Education Holds Tuition Rates for Fifth Consecutive Year". SNHU. Retrieved July 21, 2016. ^ Carley, Shane (January 19, 2017). "SNHU Welcomes Daniel Webster Students (and Programs) to Campus". SNHU. Retrieved February 15, 2017. ^ Carley, Shane (March 15, 2017). "Gustafson Center Grand Opening Honors Past SNHU President". SNHU. Retrieved October 20, 2017. ^ "Penmen Stadium". SNHU Penmen. Retrieved October 23, 2017. ^ Plourde, Melanie (September 7, 2017). "SNHU Community Comes Together for the Unveiling of Monadnock Hall". SNHU. Retrieved October 20, 2017. ^ Cousineau, Michael (November 20, 2017). "SNHU announces $100m deal to build garage, expand in Millyard". New Hampshire Union Leader. Retrieved February 13, 2018. ^ Plourde, Melanie (August 30, 2018). "SNHU Community Celebrates the Opening of Kingston Hall". SNHU. Retrieved August 31, 2018. ^ "Schools at SNHU". SNHU. Retrieved September 22, 2015. ^ LeBlanc, Paul (May 10, 2013). "Revolutionizing Competency-Based Education". The EvoLLLution. Retrieved May 10, 2013. ^ Keane, Lauren (April 14, 2017). "SNHU Announces Plans for New College of Engineering, Technology and Aeronautics". SNHU. Retrieved April 14, 2017. ^ "Three-Year Bachelor Degrees". SNHU. Retrieved July 28, 2010. ^ "Online Teaching Application". SNHU. Retrieved May 22, 2017. ^ "Regional Center Experience". SNHU. Retrieved August 30, 2012. ^ "Program History". SNHU. Retrieved July 5, 2017. ^ "About Us". SNHU. Retrieved February 10, 2018. ^ Kolowich, Steve (May 8, 2014). "Southern New Hampshire U. Designs a New Template for Faculty Jobs". The Chronicle of Higher Education. Retrieved February 9, 2018. ^ a b Kingkade, Tyler (January 9, 2014). "SNHU's Online Enrollment Is Soaring, Just Don't Compare It to a For-Profit College". Huffington Post. Retrieved February 10, 2018. ^ "Setting the record straight again (sigh)". SNHU President's Corner. Retrieved 2018-02-09. ^ Fain, Paul (March 15, 2017). "Competency-Based Degrees for Federal Employees". Inside Higher Ed. Retrieved February 13, 2018. ^ Scott, Amy (April 18, 2013). "No classes needed: Southern New Hampshire University emphasizes skills". Marketplace. Retrieved February 13, 2018. ^ "SNHU Profile". New England Association of Schools and Colleges. Retrieved March 8, 2013. ^ "Colleges & Universities Approved to Operate in the State of New Hampshire" (PDF). NH Department of Education. Retrieved March 8, 2013. ^ "Accredited Programs". Accreditation Council for Business Schools and Programs. Retrieved June 20, 2014. ^ "Sport Management Programs". North American Society for Sport Management. Retrieved January 25, 2018. ^ "New Hampshire". Accreditation Commission for Programs in Hospitality Administration. Retrieved April 28, 2014. ^ "AAC&U Members". Association of American Colleges and Universities. Retrieved June 16, 2017. ^ "ACE Members and Associates Directory". American Council on Education. Retrieved June 16, 2017. ^ "Southern New Hampshire University". National Association of Independent Colleges and Universities. Retrieved June 16, 2017. ^ "Our Campuses". New Hampshire College & University Council. Retrieved August 27, 2013. ^ "Southern New Hampshire University: Rankings". U.S. News & World Report. Retrieved July 24, 2017. ^ Boutselis, Pamme (February 13, 2012). "SNHU named 12th Most Innovative Company in the World". SNHU. Retrieved August 30, 2012. ^ Boucher, Steve (July 23, 2013). "SNHU Once Again Recognized by Chronicle of Higher Education". SNHU. Retrieved June 22, 2014. ^ Boutselis, Pamme (March 6, 2014). "New Hampshire Business Review Names SNHU "Best of Business 2014"". SNHU. Retrieved June 22, 2014. ^ Stratton, Charlotte (January 24, 2007). "New Hampshire School, Ed Leaders Win New England Higher Education Excellence Awards". New England Board of Higher Education. Retrieved July 28, 2010. ^ "Student Organizations & Clubs". SNHU. Retrieved April 2, 2013. ^ "About the Penmen Review". The Penmen Review. Retrieved July 24, 2017. ^ "SNHU Athletic Facilities". SNHU Penmen. Retrieved December 18, 2017. ^ "What is a Penman?". SNHU. Retrieved March 7, 2013. ^ "Lou D'Allesandro". SNHU Penmen. Retrieved March 1, 2017. ^ "P.J. Carlesimo Bio". NBA.com. Retrieved September 24, 2013. ^ Moran, Jess (March 1, 2018). "After 33 years, SNHU men's basketball coach announces retirement". WMUR. Retrieved March 3, 2018. ^ "SNHU Renames Field House to Honor 33-Year Head Coach Stan Spirou". SNHU Penmen. May 4, 2018. Retrieved May 10, 2018. ^ "Stan Spirou". SNHU. Retrieved September 20, 2013. ^ "SNHU in the NCAA Tournament (through 2015)". SNHU Penmen. Retrieved June 13, 2017. ^ Boutselis, Pamme (December 7, 2013). "National Champions: SNHU Downs Carson-Newman 2-1 for Second Men's Soccer Crown". SNHU. Retrieved January 3, 2014. ^ "Senate Recognition of our National Champions". SNHU. Retrieved December 18, 2017. ^ "SNHU Athletic Facilities". snhupenmen.com. Retrieved April 18, 2019. ^ "Staff". First Peoples Worldwide. Retrieved March 28, 2013. ^ "Felix Arroyo – MBA Community Economic Development, Class of 2008". SNHU. Archived from the original on June 22, 2017. Retrieved June 19, 2017. ^ "Preston Burpo – Goalkeeper Coach". New York Red Bulls. Retrieved June 16, 2017. ^ French, Kimberly (March 1, 2003). "From Riches to Responsibility". UU World Magazine. Retrieved June 19, 2017. ^ "Critical Issues Symposium Keynote Speaker: Chuck Collins". Hope College. Retrieved June 19, 2017. ^ "Edward Davis – BS Justice Studies, Class of 1986". SNHU. Retrieved June 16, 2017. ^ "Elaine C. Duke". United States Department of Homeland Security. Retrieved July 31, 2017. ^ DiStaso, John (October 22, 2015). "Republican Flanagan exploring possible run for 2nd District U.S. House seat". WMUR. Retrieved June 15, 2017. ^ "Ron Fortier '78". SNHU. Retrieved April 1, 2013. ^ "Marjoie Kilkelly's Biography". Vote Smart. Retrieved December 28, 2014. ^ "Stephen Lovejoy's Biography". Vote Smart. Retrieved June 19, 2017. ^ "Member Profile". Massachusetts House of Representatives. Retrieved March 28, 2013. ^ "Senate Majority Leader Garrett Mason". Maine Senate Republicans. Retrieved June 19, 2017. ^ "Peggy Morgan". UFC. Retrieved June 19, 2017. ^ "Member Profile". Massachusetts Senate. Retrieved March 28, 2013. ^ DiStaso, John (September 14, 2017). "NH's Pamela Patenaude confirmed as deputy HUD secretary". WMUR. Retrieved October 11, 2017. ^ "Rob Paternostro". SNHU Penmen. Retrieved June 19, 2017. ^ "Rob Paternostro – Leicester Riders". Leicester Riders. Retrieved June 19, 2017. ^ "Candidate Profile". Our Campaigns. Retrieved March 28, 2013. ^ "Annette Robinson's Biography". Vote Smart. Retrieved June 15, 2017. ^ Fields-Meyer, Thomas (April 22, 2002). "Keeper of the Peace". People. Retrieved June 26, 2017. ^ "Executive Profile". Bloomberg Businessweek. Retrieved June 27, 2017. ^ Gitaa, Tom (November 13, 2015). "Meet Samia Suluhu Hassan, Tanzania's first ever female vice president". Mshale. Retrieved June 16, 2017. ^ "Chris Tsonis". SNHU Penmen. Retrieved June 19, 2017. ^ "Commander Tate Westbrook". United State Navy. Retrieved April 17, 2018. ^ "Jason Willis". WSU Athletics. Retrieved June 19, 2017. ^ "Corey Wilson's Biography". Vote Smart. Retrieved June 19, 2017. Wikimedia Commons has media related to Southern New Hampshire University.